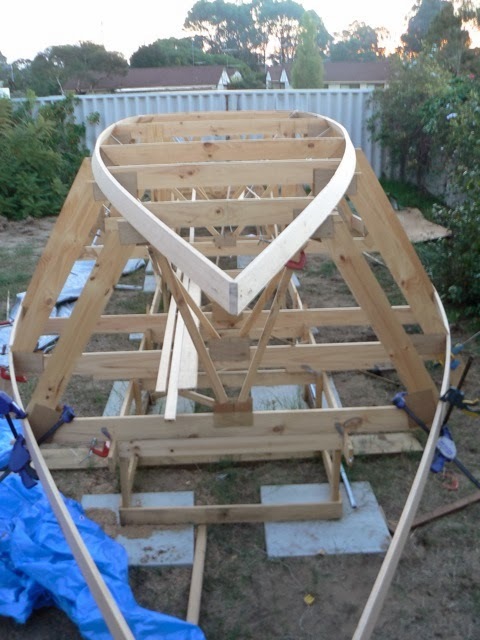 Quindalup became a time of much building activity, I altered the stern pushpit for the windvane mounting. Having all my tools on board, I could do this. Though most my power tools are too powerful for the 300W inverter (and too much for the house batteries even if I could use them), so arm powered cutting, chiselling and sanding it was. 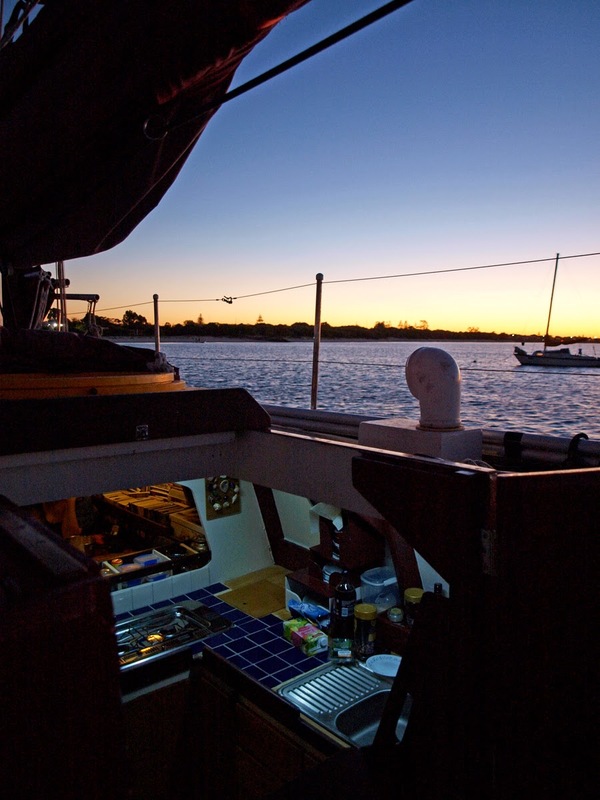 Susie had the sewing machine out (the very one she used to sew both of Ashiki's sails) and finished off upholstering the dinette and nav station cushions. The machine only uses 80W power, so no worries. We never intended to have the boat completely finished before launching, certainly not! A works in progress, a hive of industry, is Ashiki. 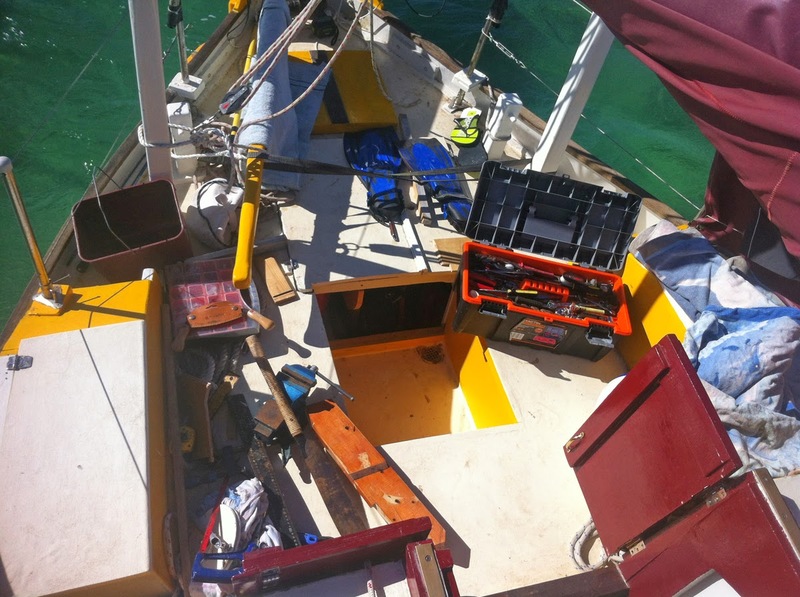 Liveaboard version of the workshop, or the shed (for Aussies). The day came to say farewell to Quindalup and its crystal clear waters, and sample the delights of Busselton, the region’s major town 10Nm around Geographe Bay to the east. When the light Nor’west breeze was strong enough Susie yet again slipped our mooring and we made for deeper water. We had all 14 panels up, none reefed and Ashiki was content at a very pleasant 4 kts while we lazed around the cockpit watching the colourful display of spinnakers on the horizon. There was a huge regatta hosted by the Geographe Bay Yacht Club (Busselton) that week, so this fleet of 40 or more boats (most down from Fremantle & Perth) had been out racing every day. 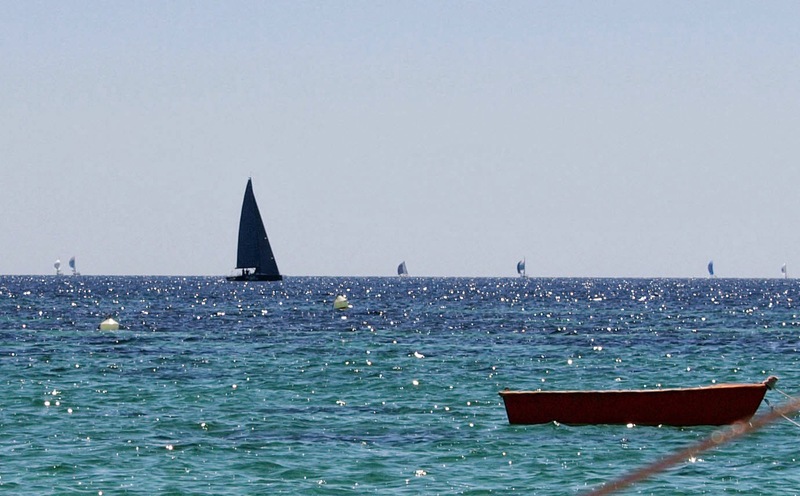 Cruising along on a perfect day with a regatta on the horizon. 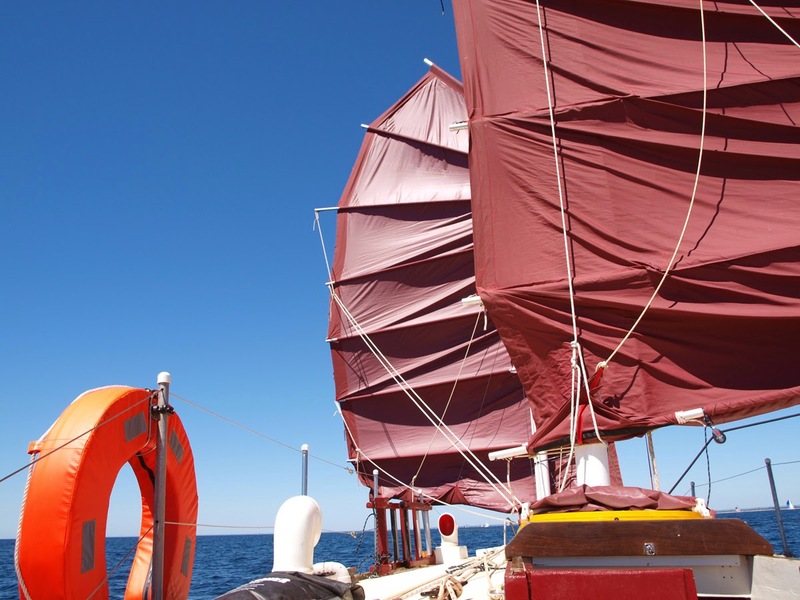 The wind backed a little and the foresail started to be blanketed by the main and lost its drive. So we gybed the foresail around to sail goose winged, or “wing on wong” I sometimes call it. The breeze stayed quite weak, under 10 knots, had Ashiki gently making way at 3.5 to 4 kts. I saw the race fleet come down to a buoy dead ahead of us, so we altered course a little towards the coast to give them room. I wondered how we compared speed wise, but those boats, 30 to over 40’, were all ultra lights with huge spinnakers, they had a good knot over us when we drew level in the light conditions. Can’t have everything. But there was another boat, 35’ ish, cruising style, without a spinnaker who had the same idea. He reached down infront of us, turn tightly around the buoy and gave chase to the racers. Having no good downwind sail, he slowed right down. We passed him. He had someone on the foredeck trying to hold out their big genoa, but after 20min, he was far behind. No match for the huge twin barn doors of a junk rig schooner I’m afraid. 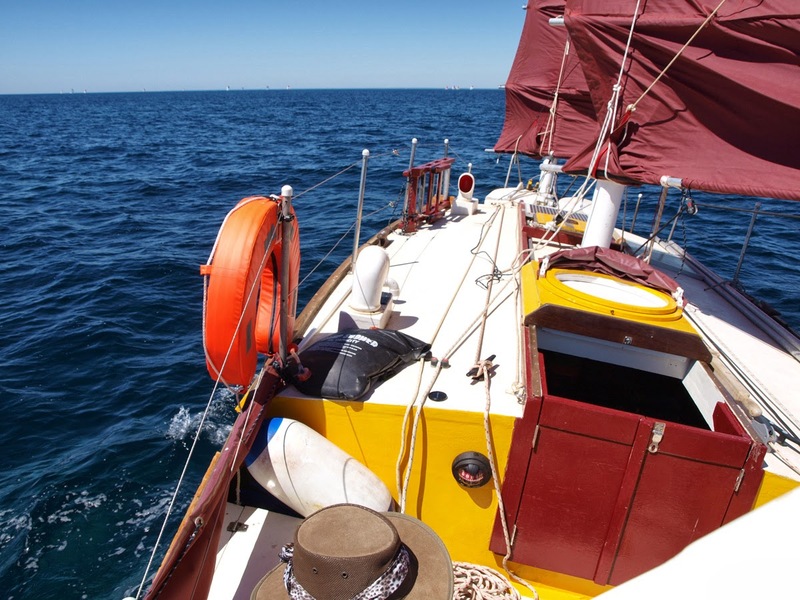 Anchored off Busselton, slid in under sail, dropped the pick. Finished a great day's sail. Of course it's unfair because we have more sail area than regular yachts. It’s the reason behind Ashiki’s good light air performance, superior off the wind and because the panels are cambered, she gives nothing away to windward. I realise I go on about this in this blog. But I know Ashiki proves a point over the online knocking that junk rigs get. Anyway, sailing performance interests me, as it tends to interest sailors who are thinking of going the junk route themselves.